The first single from the album The Unforgettable Fire, it can also be found on the Best of 1980-1990/B-sides compilation. The song was developed during a sound check at the November 16, 1983 Honolulu concert. Pride is a tribute to Dr. Martin Luther King, Jr. and his portrait appeared during the song at the October 18th concert in Lyon, France. Mrs. Christine Kerr. who is thanked in the liner notes. is actually Chrissie Hynde of the Pretenders. During the time of the album's recording she was married to Jim Kerr of Simple Minds and provided backing vocals to Pride. This single was released in several formats, the two most collectible being the 7" picture disc and a 12" with a blue cover. The single peaked at No. 33 on the Billboard charts. It made its first concert appearance during the early performances of the Live Under Australian Skies tour in 1984. The song was also in their set for the May 17, 1986 Self Aid festival in Dublin. During the Save The Yuppies concert in San Francisco, Bono spray-painted a statute with the words 'ROCK & ROLL STOPS THE TRAFFIC'. He was charged with a misdemeanor and paid to have the graffiti removed. U2 made an animated appearance on the 200th episode of The Simpsons on April 26, 1998 entitled Trash Of The Titans. They performed part of Pride during the PopMart concert in the imaginary town of Springfield. The song was featured in another television show, Miami Vice on the 2-hour premiere of the Prodigal Son for the second season. The single was voted No. 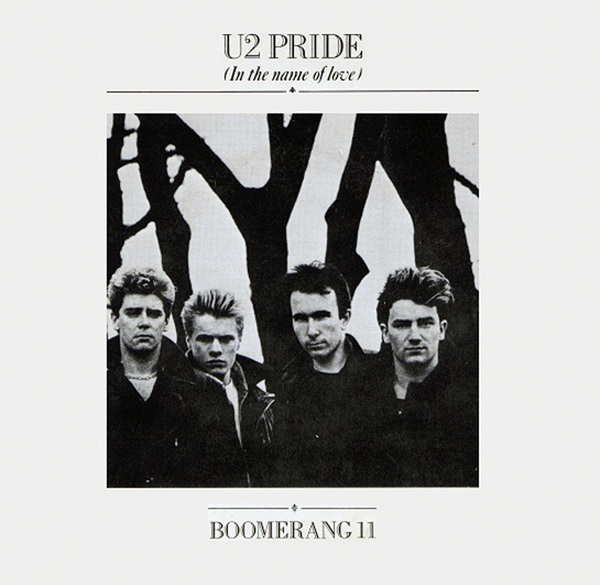 1 Best Single in the Hot Press Readers Poll and scores of artists have also recorded the song, including: the Royal Philharmonic Orchestra on Pride: The RPO Plays U2; Studio 2000 on The Best of U2 Gold; Razed in Black on We Will Follow: A Tribute to U2; Inbetweendays on Zoovenir - A Tribute to U2; Hawaiian act Hapa on In The Name Of Love add ancestral chants and a snippet of MLK;Dustin on Faith of Our Fathers; Extempo on Channel 32 who do an a cappella version, and Barbara Dickson on After Dark. Two groups have released a Pride (In The Name Of Love) single of remixes: the Kingston Club released a reggae-inspired version while Clivilles & Cole released techno remixes of the anthem on a single and their album The Best of C&C. One of the versions by Clivilles & Cole also appeared on the soundtrack to the movie Gladiator.